In almost every state of the country, ants are considered as the most common insects that are found in gardens, yards, and fields. 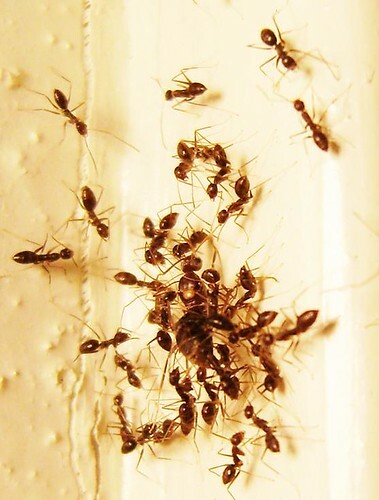 Ant colonies can be found in a typical residential home; however, most of these colonies are usually out of sight. In fact, it is only when ants start to invade a property that they come to our attention. Generally, ant activities are quite beneficial, and they don’t immediately impose serious threats and health risks to human beings. Despite this, there are certain ants that can deliver painful stings and can destroy home structures; thus, we need to be concerned about their presence. The most common types of ants that sting are the fire ants and harvester ants. The carpenter ants, on the other hand, are also quite common because they can damage the building materials used for the house. There are also ants that may not cause structural damage, and may pose very little health risk, but they can still invade your home in search of food and water. Fire Ants: These insects are red in color, and they have large eyes and stinger which is located near their abdomens. This type of household ant is very aggressive and they can inflict a painful sting when their nests are destroyed or if they feel threatened. Fire ants create nests in dirt mounds usually found in your lawn. Carpenter Ants: These insects are considered to be the most common type of household ants. They may have a black or a black with reddish-brown color. These insects nest in wood; thus, they can damage your wooden structure and furniture at home. Odorous Ants: These insects got their name due to the odor released when they are crushed. This insect is identified by their black to dark brown color and uneven shaped thorax which is the middle part of the ant’s body. They usually dwell near pipes, wooden structures, and holes in the wall of a house. Pharoah Ants: They are light brown in color and they usually nest in buildings and home structures. This type of household ants feed on various foods, such as cakes, jellies, and pet foods. They are usually found in dormitories, apartments, residential homes, and even in hospitals. If they are ignored, they can be a serious threat. Alcohol: If you want to use a more natural approach to getting rid of the annoying ants at home, you can create a mixture of 20% dish soap, and 40% of both alcohol and water. This will eliminate the ants that are following the ant trails, and it also prevents others from using the same route. This is possible because the mixture will get rid of the chemical trails, known as pheromones, left by these insects. Chalk: You can also deter ants from gaining entry to your home by drawing a line around their potential entry points. You can also consider spreading a powdered chalk on your plants to repel other insects. This is very effective because these little critters do not like the calcium carbonate present in the chalk. The calcium carbonate is made up of ground-up and compressed shells of sea animals. Herbs: The best herbs for getting rid of ants include black pepper, cayenne pepper, garlic, mint, and cinnamon. As a tip, you can use bay leaves and spread them inside the kitchen drawers and cabinets to keep these nasty little critters out of your kitchen. The bay leaves have a strong smell that discourage ants. Borax and Sugar: You can mix sugar and borax in equal parts to create an effective and safe home remedy to eliminate these pesky insects. The ants will be drawn towards the sugar; thus, they will bring it to their nests where the borax powder will eventually kill them and the colony. Diatomaceous Earth: This is a highly effective home remedy for ants and other insects and bugs. You can sprinkle it in areas where you find ant trails or their potential entry points. Make sure though to get the right kind of diatomaceous earth. Get the one that is used at a garden or nursery. Avoid getting the one used for pools since these are dangerous for children and pets. The author, Kris Lim, is a freelance writer for home and lifestyle websites. She offers simple and basic home remedies that can help get rid of ants at home.